More than 1,500 kilometres behind steam with more than 110 different runpast locations! In this post he didn’t even mention other challenges, which led to replacing planned trains in the Western Cape Province by trains in Natal, prices which went up between 30 and 50 % compared to 2006 and other obstacles. Due to these difficulties, there has been no similar big-steam tour since then, only some smaller events. But steam charter trains never came to a complete halt and the temptation to try to arrange another tour reached a new level when, in mid-2018, it became clear that the famous Class 26 No. 3450 “Red Devil” would soon be back in life. David generously forwarded his knowledge and gave me precious contacts from his list; experienced people on the ground, who know the requirements of such a tour for demanding and sophisticated photographers and video film makers. The state railway has recently become more relaxed about running steam trains on their lines. But the major problem of steam locos causing fires still remains. You may have heard about the major drought that the Western Cape faced in recent months and that Cape Town was close to actually running out of water. With good rains, the reservoirs are more than half filled by now, but there is still the fear that hard-working locomotives with medium or bad coal are a risk for the farms nearby the line. We can’t overcome these fears and will need to invest in fire protection. 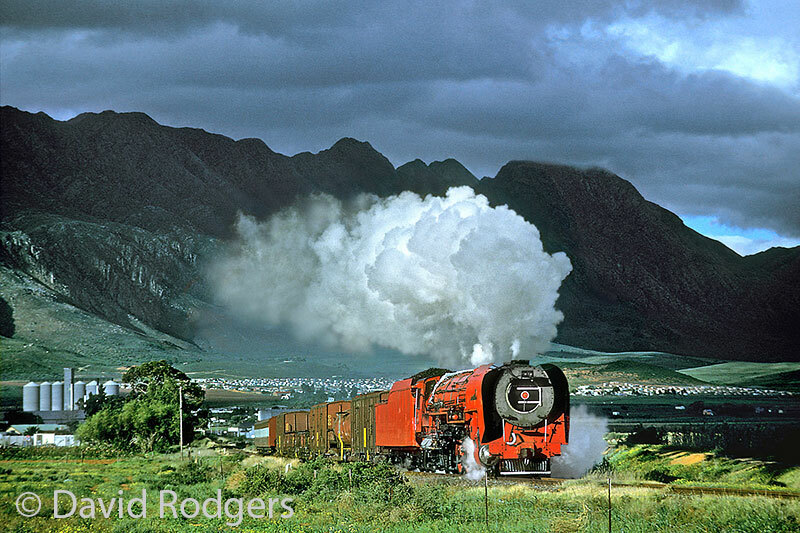 It took eight months to compile a tour which is feasible, affordable (to a certain extent, at least) and will give you some authentic looking trains in the exciting South African landscape. The conditions for such tours haven’t improved very much since 2007 - the prices are further up, on the other hand the steam infrastructure has further reduced, the required, historically authentic, wagons have almost completely vanished from the railway and the number and classes of available locomotives has declined over the last decade. Under the given circumstances, we have made the best out of the limited resources and can now offer a tour with four classes, 19B, 19D, 24 and 26 (David Wardale’s “Red Devil”). We’ve planned more than 1,500 kilometres behind steam and more than 110 runpasts at different locations. We’re negotiating about adding a 15F to the programme, but the enormous costs for a transfer of more than 1,500 km, (one way!) do not make us very optimistic in having this locomotive available. From experience, it is unwise to publish a detailed itinerary at this stage. Shortly before we leave for South Africa, all participants will get a detailed plan, as usual. There is no guarantee that we’ll do the train tour in the order we’re showing below, but the mentioned lines will be part of our programme. We’ll use the Klawer line for our first charter trains. We’ll do only the southernmost part of the line and stay in the most scenic sections. Another day on the Klawer line. The Klawer line offers so many good spots, gradients and sweeping curves, that we’ll spend yet another day on this line before our buses take us to Ceres, where the group needs to be split for overnight accommodation. 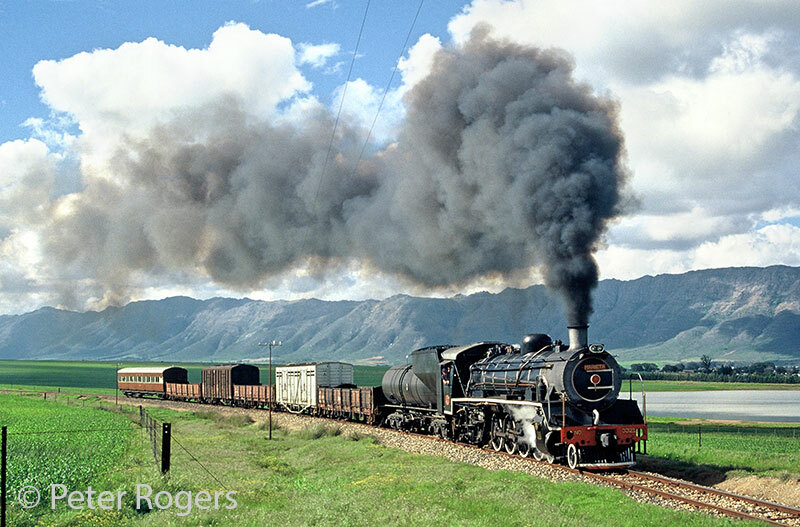 The gorge section between Ceres and Wolseley on the line to Prince Alfred Hamlet will be explored using a charter train. 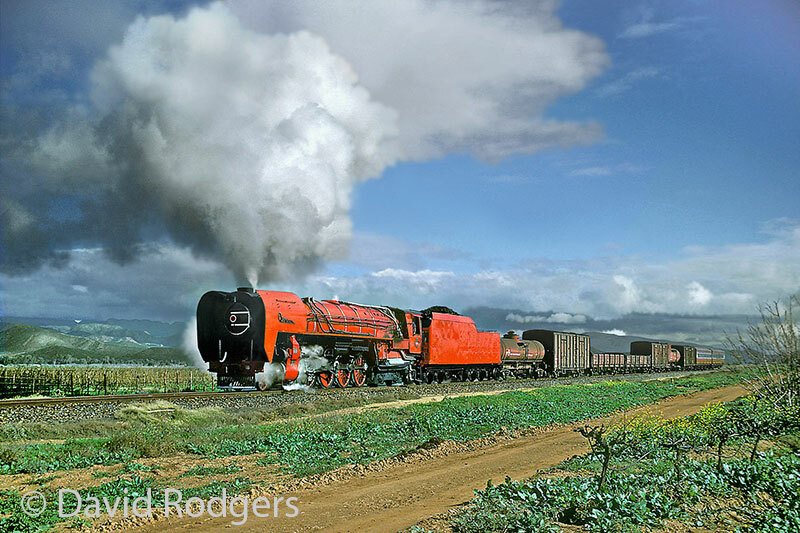 Today we start to explore the Western parts of the stunning, former New Cape Central Railway Worcester  Mossel Bay line. With a different train composition, we’ll continue to run over this beautiful line. The line has so much potential that we can easily spend another day here. 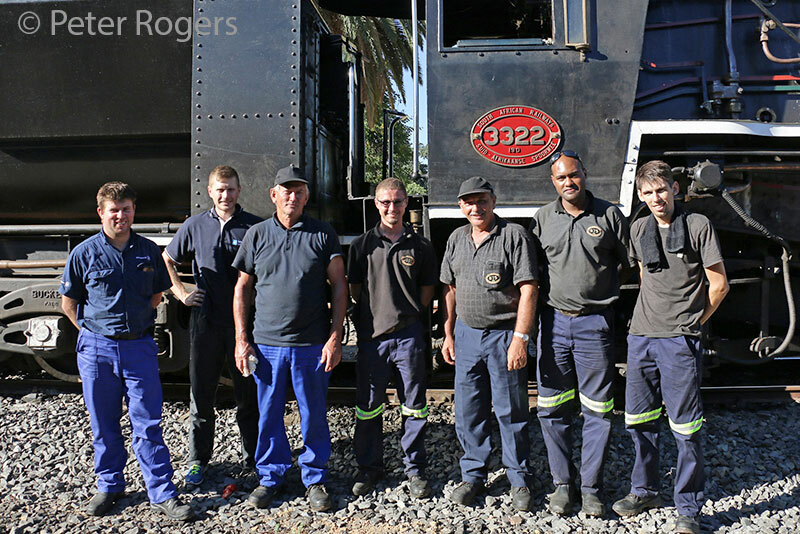 With a different loco combination, we’ll continue to photograph on the Worcester  Mossel Bay line and return to Ceres at the end of the day. In the morning we'll go to a vineyard in Stellenbosh where we'll have lunch (and, maybe, a good wine). Afterwards our tour bus will bring us back to the airport of Cape Town. Return flights can be booked after 4.30 pm. If you want to book an earlier flight we'll arrange you a direct transfer from Ceres to the airport. We’ve planned double headers, as well as night photography. Charter bus to the wine farm in Stellenbosch where we’ll visit the visit Vergenoegd winery. Hotel in Cape Town. We’ll continue to Port Elizabeth (Nelson Mandela Bay) and have a brief visit to the colonial city hall. In the afternoon we'll take a look at the railway premisis of the Apple Express narrow gauge railway and will have a (medium authentic) steam hauled charter train with an NG15 to the airport station. In the later afternoon we’ll continue to the Malaria-free Addo Elephant Park. Our accommodation sits on top of the Zuurberg Mountain range and offers fantastic views into the countryside. The Addo Elephant Park is the third largest national park in South Africa and hosts not only elephants but also lions, zebras, Cape buffalos, black rhinos, antelopes and other species. We have booked a safari trip. Hotel in the national park. The bridge at Moravia is spoiled by new houses these days, so not everything can be “copied”. The available locomotives were not originally used on this line, but without allowing compromises to a certain extent after more than three decades from the end of steam, you would need a Hollywood budget. Anyone want to donate? Our train will be a typical mixed train as in the days of steam. In general we’ll avoid using tank wagons behind the locomotive, although it used to be authentic in the steam days as well - not so much on this line, but on others. You need to scroll down to picture 42 to get to the Ceres branch. 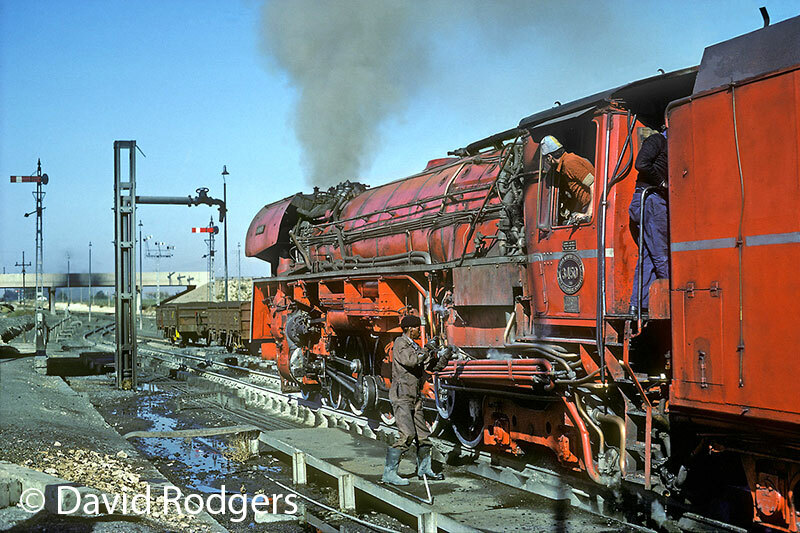 It saw steam until 1976, more than 40 years ago. It’s amazing that you can still do shots which are very close to the original steam workings! The Langeberge mountain range, with its peaks almost 1,700 metres (some 5,500 feet) above sea level, form an impressive backdrop to the line which oscillates around an altitude of 200 metres (650 feet) with gradients in both directions, many bends and S-curves and beautiful settings. The first part of the line reminds us a bit of the lines where the “Red Devil” was used in its active days, hence we’ll use it here. We will make sure that we have sufficient authentic brown freight wagons and the passenger coaches will be re-painted into their late steam-days original livery. The tour is planned in detail by very experienced people with the dedicated photographer and video film maker in mind. Not every wish has come to fruition, but be assured that we have discussed all the opportunities. There are several limitations which we need to consider, the price is one of them. There is also a strict 12 hours working rule for train crews. There are some regular trains on the lines. Locos and wagons are allocated to a certain shed and cannot be transferred for thousands of kilometres without bursting the budget. What we’re offering here is the maximum possible within all the mentioned and non-mentioned limitations. 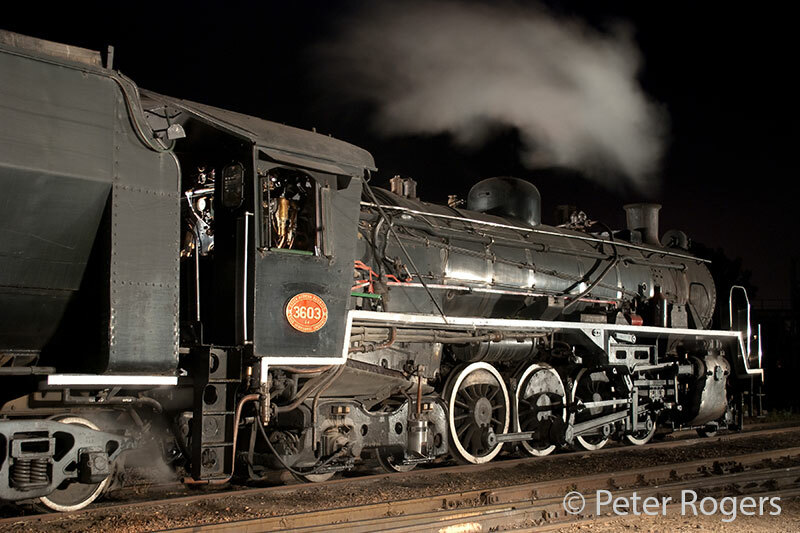 We have four locomotives scheduled for our tour which makes us sure to run all the planned sections behind steam. However, the locomotives we’re using are unique in the region and we will not have a replacement in case one of these locos fails. There is no guarantee that a certain locomotive will be used. Our trains usually will carry a passenger coach at the end of the train (as it was always normal for mixed trains). However, it’s not advisable to wear your best clothes on such a tour. White or clothes with intense colours are also not appreciated, in case you happen to be standing in someone else’s picture. High visibility clothes will kill their shot, while dark, brown or black colours won’t disturb too much. The daylight hours in June, the winter in South Africa, are limited. On June 15th, sunrise in Cape Town is at 7.49 am, sunset at 5.43 pm. We’re aiming for the early morning and the late afternoon light conditions. This means we’ll need to get up before sunrise. Meals are included in the tour price but doesn’t mean they’ll be served at a set time. The reason why we’re going to South Africa is to photograph authentic looking trains on fantastic lines at the best time of the day and not to have a sumptuous breakfast at 9 am, for instance. Having said this, meals can be served packed or postponed. In the evening we’ll usually have time for a proper dinner. If available we’ll offer dinners as buffets. Our hotels are of different standards. At some smaller places we need to split the group over different places. There will be different standards at different places, but all will be clean and offer a hot shower. The number of available single rooms is very limited. We cannot guarantee to have a single room available at all locations. Single room bookings need to be confirmed manually; an instant confirmation from the booking system is not valid for this particular tour. The standard of our accommodations will be three and four star. Temperatures can drop below freezing point, while during the day we may reach temperatures of more than 20 degrees centigrade. Although we’re hoping for sunny weather, we may see some rainy days. Please be prepared: rain coat, jumper, jacket, sturdy shoes are essentials which you should carry with you, as well as sun cream and a cap. Most of the photo spots we’re going to haven’t seen photographers for a long time. Vegetation will be a problem  which can be overcome easily by using grass slashers. The more of our group will help, the more photo stops will be possible. If everyone heads for the “best spot” and stands there until a lonely slasher has cleared the line of grass it may take half an hour  time which will be lost for other runpasts. There is sufficient space for everyone to get a master shot in the box. This said, please first help to clear the spot and then head for your position. We’ll not perform a runpast before everyone is in position. It’s a group event and the best result is obtained when everyone in the group cares for the needs of each other and helps when help is required. The region we’re travelling to is considered to be Malaria-free. No special vaccinations are required (except when travelling from Yellow-fever areas to South Africa). However, if you wish to visit some of the famous game parks before/afterwards, including the Kruger National park, you should take some Malaria prophylaxis because the dangerous Malaria, Tropica, causes 90% of all Malaria infections in South Africa. If you need prescription medicines, you should bring them from home as it might be difficult to get these outside the big cities. When packing your luggage remember that travelling light is the best way to enjoy the tour. We’ll not have porters and you need to carry your own luggage on most occasions. For most nationalities no visa is required. Please check with your local embassy if you need a visa (New Zealanders are affected). You’ll need some local money (Rand) on the tour for beverages and tips. For tips US-Dollars are accepted as well. In the countryside you’re almost as safe as in central Europe, for instance, but in some of the big cities the crime rate is frighteningly high. Some parts of cities should be avoided, even during daylight hours. The best protection against crime is not to show you are carrying expensive photo equipment with you and to stay together with others from the group. Please bear in mind that accommodation and transportation in South Africa, although a highly developed country, often falls short of EU, Australian or North American safety standards. Always use common sense when crossing roads and railway tracks. Neither the local tour operator, the state railway, the Ceres Rail Company, nor FarRail Tours Club can be held responsible and will accept no liability whatsoever in the case of any accident, damage or bad effects due to delays etc. We suggest you take out a comprehensive overseas accident and health insurance policy. You may consider trip cancellation insurance as well. All hotels and guest houses, on the cultural extension all hotels four star, optional upgrade Camp Figtree in the Addo National park (three nights): single room: £310, double room: £220 p.p. Tips, please expect some 20 US Dollars per day per person.